The Chandler Burning Index is another Fire Rating System primarily used in North America. The Fire Weather Index (FWI) System is the first part of the Canadian Forest Fire Danger Rating System (CFFDRS) and is used in Wisconsin. 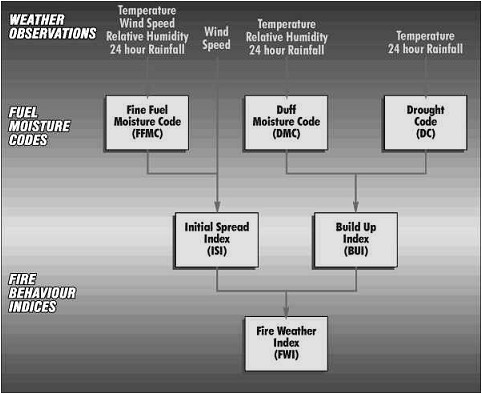 To interpret the system the three fuel moisture codes and the three behaviour indices need to be understood. Each code and index is a numerical rating related to likely fire behavior. The scales start at zero, and except for the Fine Fuel Moisture Code which has a maximum of 99, all are open-ended. Low ratings indicate high moisture content, and ratings rise as moisture content decreases. Ratings rise as fire weather becomes more severe. The FWI System evaluates fuel moisture content and relative fire behavior using past and present weather effects on ground level fuels. The moisture codes reflect the nett effects of daily moisture gains and losses. The three behaviour indices are relative to the fuel moisture content. They indicate what a fire is likely to do. The lower the moisture content, the higher the Fuel Moisture Codes, and the higher the Fire Behaviour Indices – and the more active the fire will be. Information from the ISI and BUI is combined to provide a numerical rating of fire intensity – the Fire Weather Index. The FWI indicates the likely intensity of a fire. FWI definitions compliments of FWI Calc. The height of the lowest layer of broken or overcast cloud layer.